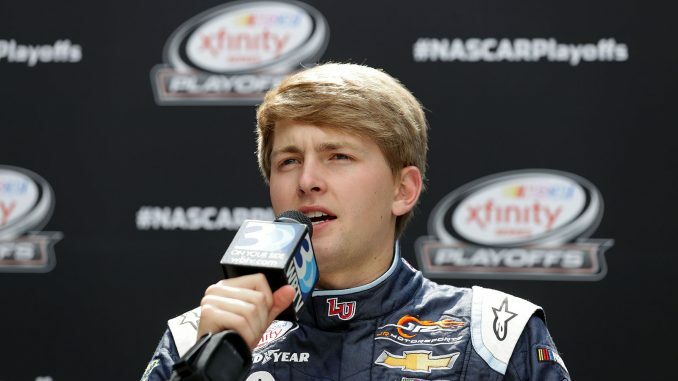 DAYTONA BEACH, Fla. – William Byron’s face brightened and he laughed a bit talking about his new high-definition reality as a member of the championship Hendrick Motorsports team in the Monster Energy NASCAR Cup Series. The 20-year old rookie got his first taste of stardom earlier this week and said he was a little taken aback when he unexpectedly got “recognized” having dinner at an Outback Steakhouse near Daytona International Speedway. “That part has been different,’’ Byron said smiling. “I went out to eat last night and I got stopped by four or five people in the restaurant, and that was so different knowing that people were knowing what we were doing. It’s something Byron really should get used to. The driver of the famed No. 24 AXALTA Chevrolet is following in the footsteps of retired driver Jeff Gordon who earned four championships in Hendrick’s No. 24 and more recently, the 2016 Rookie of the Year Chase Elliott who switched to the No. 9 for this season. Byron comes into his big opportunity well versed in success. He won seven races and had 16 top 10s in 23 races as an 18-year old rookie in the Camping World Truck Series. Last year he won four races and had 22 top-10 finishes in 33 starts en route to the Xfinity Series championship. The spotlight is bright, the expectations substantial. And he handled his first Daytona 500 Media Day well, offering well-thought out answers to the large contingent of reporters – also showing both a good sense of humor and perspective. “The fan support and the drivers who came before us at Hendrick Motorsports is something that we can build on,” said Byron, during the day-long media event in advance of Sunday’s Daytona 500 (2:30 p.m. ET on FOX). “It’s a golden opportunity to go out and show what we can do. We have great race cars and great fan support. We’re already way ahead of what most rookies have to go through, and I feel like that’s an advantage for me and the fans will be eager to see what we can do on the race track in the 24 car. So far in Daytona Beach, Byron seems to be adjusting to the career move. He led the second round of Monster Energy Series practice last weekend and then qualified fourth – missing the front row by only sixth-tenths of a second. It certainly left him enthusiastic about his chances in his first Daytona 500 start. He was already optimistic about his chances this season. “I want to go out there and show what we can do as a team, but I think that comes more from my competitive instinct and drive that I have to win,” Byron said. “If I didn’t start reaching my goals my first year I would be a little frustrated and I would work to be better. “It will come from within and from our team. I think if you can start to build on top 10s; a lot of people say top 10s lead to top fives to wins. With our team, that’s true. If I can build on some top 10s and develop that into some better results we can lead some races.